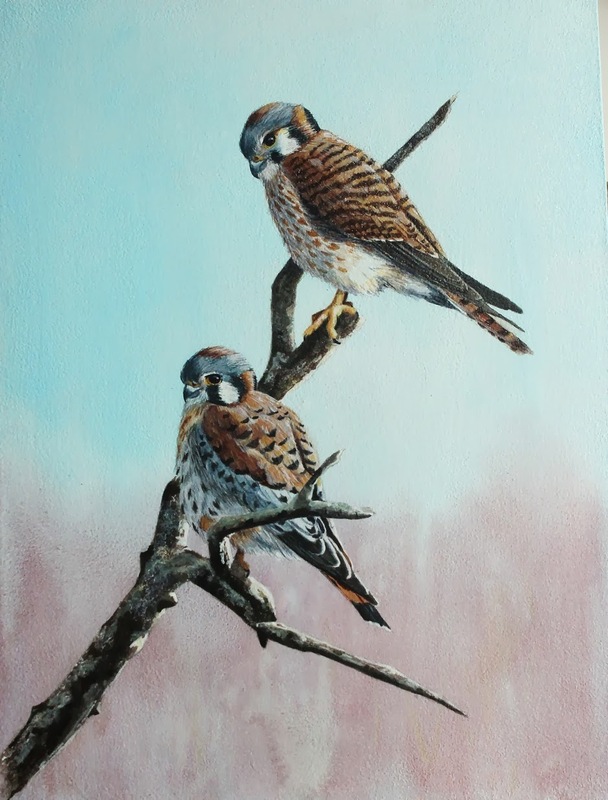 Well, I finally got the painting of the kestrel pair finished this week. It was going along pretty well as far as the birds were concerned, but the idea for the washy background just didn't work. Since I didn't know what to do with it I set it aside to ponder my options. Still coming up with nothing I asked my resident art critic, a.k.a. my husband. "You need to put some things at the bottom", he said. Okay. Great. Like what kind of things? "Oh, you know, like some kind of stick things or grass things, but keep them vague and indistinct." Okee, dokee, glad I asked for his expert advice. But guess what? Turns out he was right! I hate to have to admit that! Don't tell him I admitted it on the internet!!! Here is the finished piece. I think the "stick and grass" thing was just what it needed. 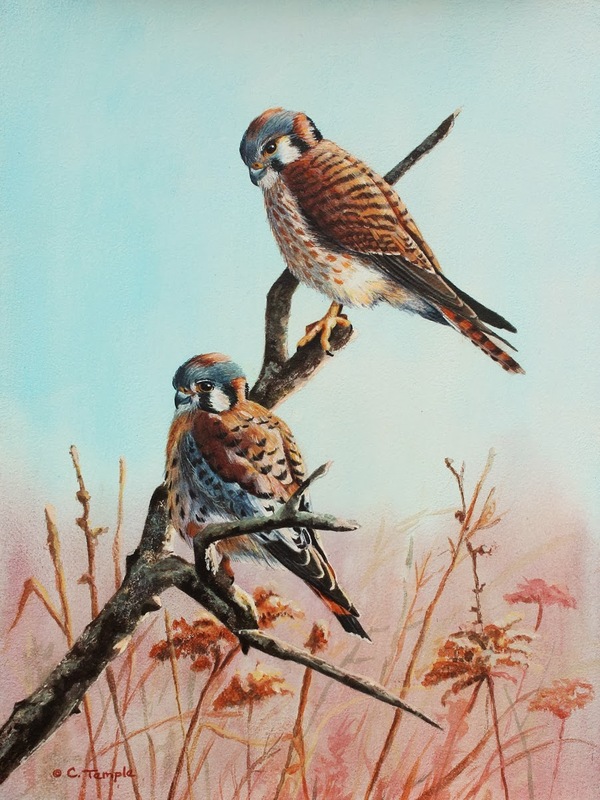 This piece will be available for purchase directly from me or you can visit my Daily Paintworks gallery where you can view it and many of my other art pieces. 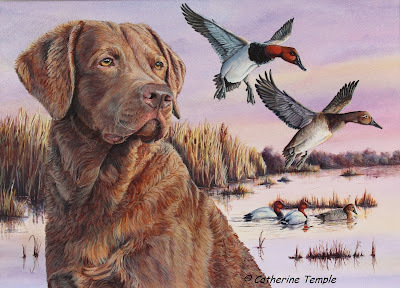 There are a few things in the bird world that really get my blood pumping…raptors of any kind, hummingbirds in my garden, ducks coming into the decoys and the plaintive cry of hundreds of Tundra swans migrating overhead. The sound is otherworldly, primeval and stirs my soul like no other bird call. The birds themselves also move me deeply. 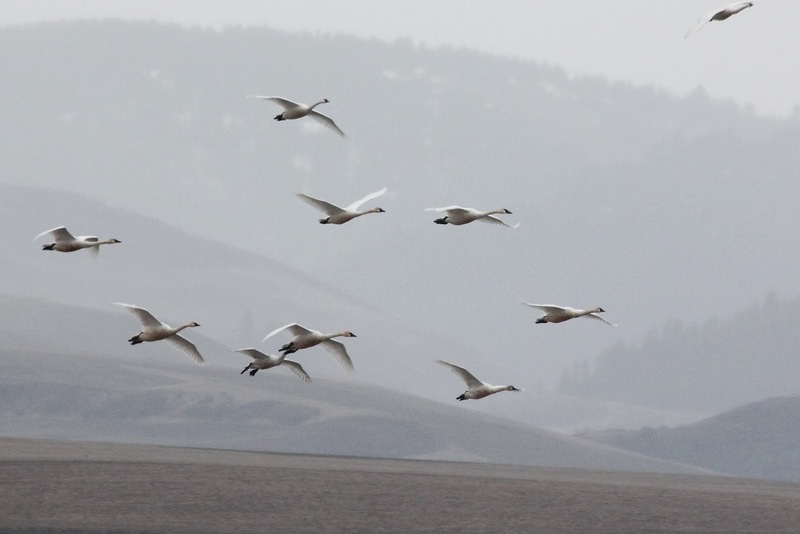 My experience with them has always been to see them migrating on moody, cloudy, rainy days, their large white forms circling like phantoms overhead. I have yet to see them on bright, sunny days so when the unsettled weather of March rolls around I start getting restless just like the swans. I stare at the dark clouds and listen intently for their call. It has even awakened me from sleep in the middle of the night and I fly out of bed and out the door peering into the darkness above for their ghostly shapes and straining my ears for that call, the one that makes my heart leap and my soul sing out in answer. When I woke up this morning and looked out at another gray, rainy day I almost let it depress me. 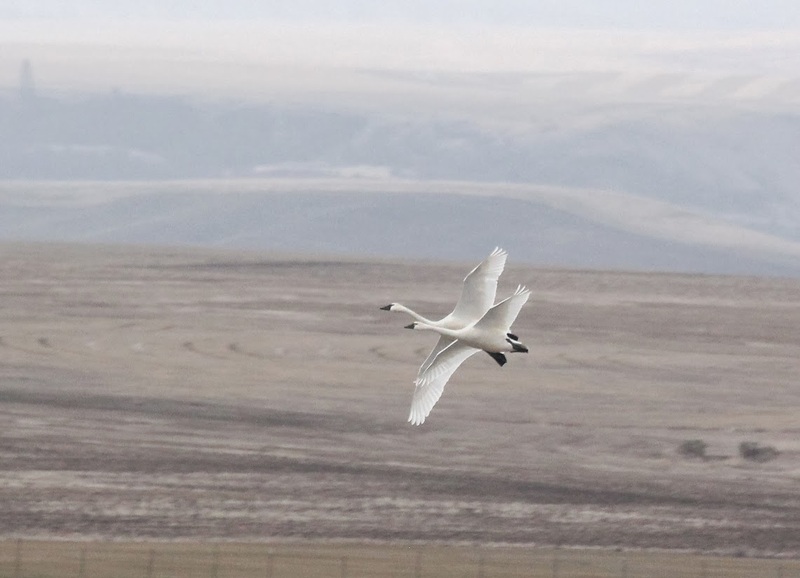 Then I thought, "maybe the swans are at Mann Lake" and decided to grab my camera and do my morning walk there. Arriving at about 8:30 a.m. I looked across the lake and saw some vague white forms floating eerily. Swans! But they were on the far side of the lake, too far for any photos. Fortunately, there is a road near that side and access trails so I hurried over watching the sky as I drove. I was watching for swans and watching the clouds because it was growing darker and I could see a squall moving across the fields. From the other side of the lake I had a closer view and could now hear them calling softly to each other. I quickly donned rain gear, grabbed the camera and headed down the trail. The sky was getting noticeably darker now and I could hear drops hitting the vegetation around me. I was losing light for good photos and was about to head back to the truck when I heard faint calls from somewhere above me. The swans on the lake were beginning to call more excitedly, too, so I knew something was about to happen. Then, about a hundred white forms appeared in the heavens like angels slowly floating to earth. Gradually, they started to take the shape of the swans. My heart started to pound and my hands started to shake as adrenaline was coursing through me so moved am I by the sight and that call. I fumbled with the camera trying to adjust for the poor light, the distance to the swans and their movement as they glided in. They seemed so high at first, but in a matter of seconds they had drifted down, necks held back, feet down, feathers adjusting for landing. Then they joined the others on the water. By now the rain was coming down harder and fearing I was going to drown my camera I stuffed it in my coat and reluctantly headed back down the trail to my truck. My timing had been perfect as far as arriving to watch two flights come in, but the rain kept me from staying longer. From the warmth of my truck I cracked the windows and listened for a while to their plaintive yodeling and the sound of the rain. It had been a soul filling morning!